With Spring fast approaching, I have decided to switch up my makeup routine and bring out all of the eyeshadows I don't tend to use as much. 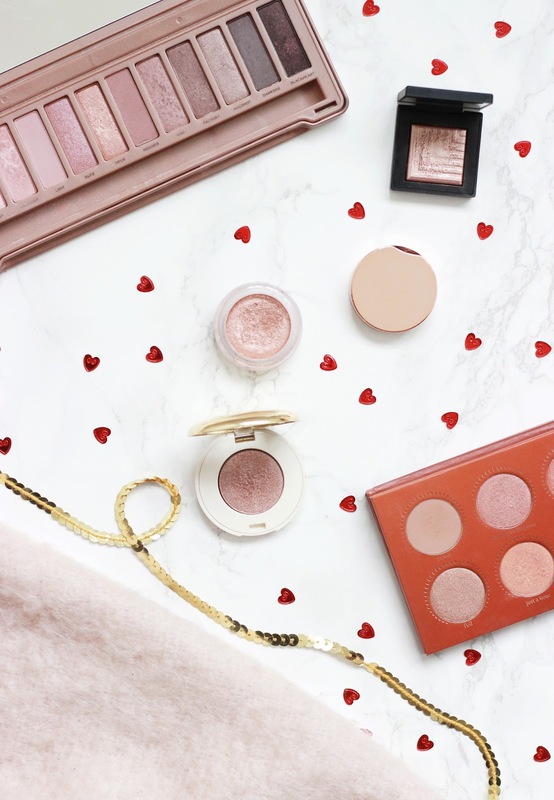 I've been loving perky pinks and dreamy shimmers throughout my makeup routine, but especially on my lids. Today I have rounded up my top picks for you to have a peek at. If you've been reading my blog over the past few weeks you'd have noticed that I'm currently rekindling the love with my Urban Decay Naked 3, a palette that is made up of an array of 12 shades to fulfil all my smokey eye needs. I'm currently smitten with the shades limit, trick and nooner as the matte and shimmer contrast really helps to create a gorgeous look. Although MAC Tan is more on the copper side than pink, this rose gold hue has been one of my favourites ever since I got it. When used with a damp brush, this creates a vivid statement eye that lasts all night and works well in conjunction with other pink eyeshadows. The Clarins Aquatic Rose and H&M Paradise Lost eyeshadows are both one sweep wonders that look great on all occasions and require minimum effort. With speckles of gold and pink in each, they are perfect for evening looks with a thin winged eyeliner and several licks of mascara. I own far too many Zoeva eyeshadow palettes and when I was having a clear out, I came across the Rose Golden Palette and was instantly drawn to the lighter, pinkier shades. I have really loved rediscovering this pick and the shimmer shades are perfect for using in conjunction with a darker brown hue through the crease. I feel like I talk about Nars Rigel Eyeshadow every couple of days on my blog, but seriously; the highlighting shade has got to be one of my most used over the Winter months. I will no doubt be bringing this into the Spring and Summer as it's great at brightening and widening the eyes for an easy look in the morning. What are your favourite pink eyeshadows?